Did you know that factory retail outlets, shopping centres where you buy directly from manufacturers, are over 80 years old? The concept started in the USA in the ‘30s becoming an ever-present feature of 21st century global suburban landscape. These days many of us shop online, for example in the UK alone retail online sales totaled a staggering £91bn in 2013. 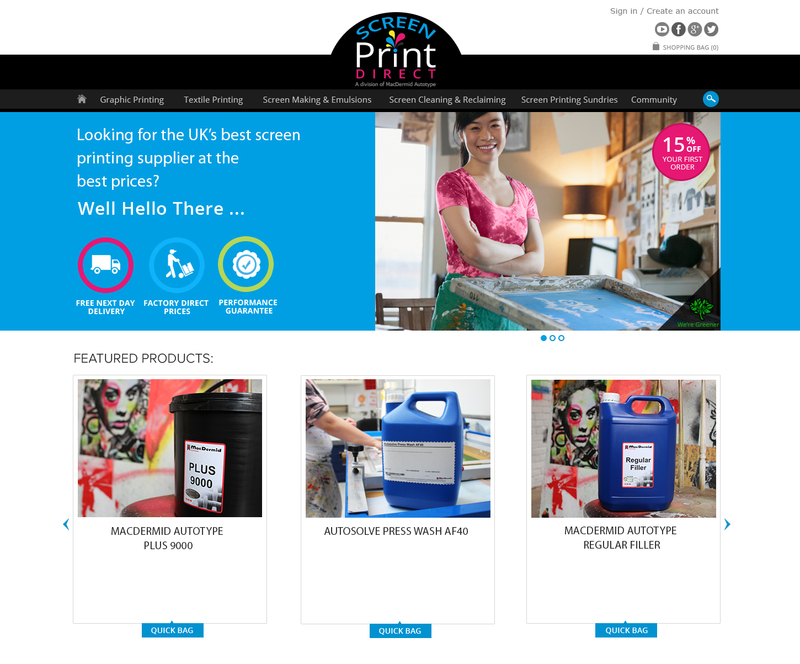 Therefore, it’s no surprise that one of the leading global manufacturers of screen printing consumables has decided to launch its very own state of the art online outlet. The new MacDermid Autotype ‘factory direct’ Webstore is being launched this month and is the first of its kind in the UK. Called Screen Print Direct, http://www.screenprintdirect.co.uk, the e-commerce site offers an attractive and easy to navigate interface where screen printers can select the required products among some of the most popular high quality direct emulsions and screen making chemicals that are manufactured by the company. A click of the mouse drops them into the shopping bag for secure online payment at ‘factory direct’ prices and what is more, standard next day delivery* is included in the price. In addition to great value ‘factory direct’ prices, to celebrate the launch of the new service, you will also receive a further 15% discount** on your first three orders, all with next day delivery included – a real bonus in the current economic climate. Savvy screen printers should definitely get online now, stocking up for the next few months to take advantage of these massive inflation beating offers. printing videos and ‘How to Screen Print’ guides through training resource partnerships with organizations such as Squeegee & Ink and the London College of Communication. By providing screen printers in the UK with the best products at the most competitive prices, combined with expert back-up support, printers can get the very best out of high quality Autotype screen supplies, making the most interesting and diverse printing come alive! * To qualify you must spend a minimum of £75 per order. **This promotional offer is valid until 17 December 2014. All orders are subject to our standard Conditions of Sale. Offer is only valid on deliveries in mainland UK. This entry was posted in Screen Printing and tagged screen printers, Screen Printing, Webstore. Bookmark the permalink.